William David Hinshaw4,12 [William D. Henshaw13]. Born Nov 29 18822,5,12 [Nov 29 18831,3,7], Jasper County, Iowa2,5,12. Hinshaw, William D., head-of-household, age 27, born in Iowa; parents born in Indiana; first marriage, married 5 years; occupation: laborer, stock farm; rented home. 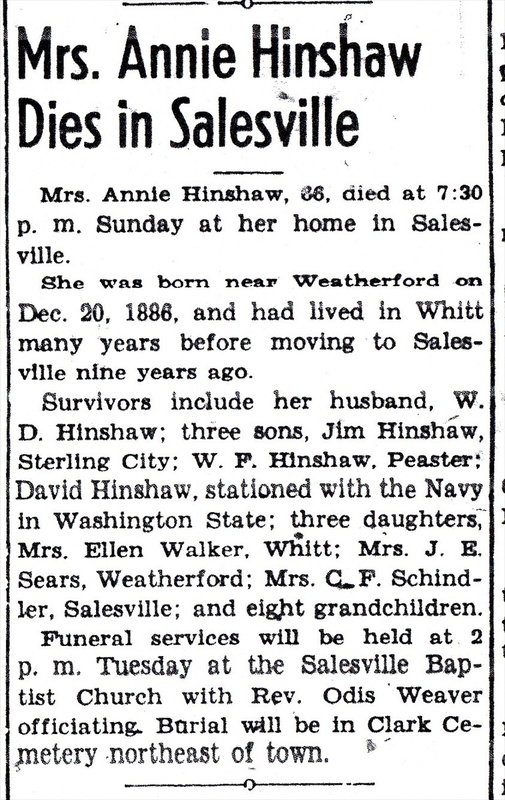 Hinshaw, Annie, wife, age 24, born in Texas; father born in Missouri; mother born in Illinois; first marriage, married 5 years; 2 children, 2 living. Hinshaw, James, son, age 4, born in Texas; father born in Iowa; mother born in Texas. Hinshaw, Ellen, daughter, age 3 months, born in Texas; father born in Iowa; mother born in Texas. Hinshaw, Will, head-of-household, age 47, born in Iowa; parents born in United States; first married at age 21; owned home; occupation: farmer, farm; not a veteran. 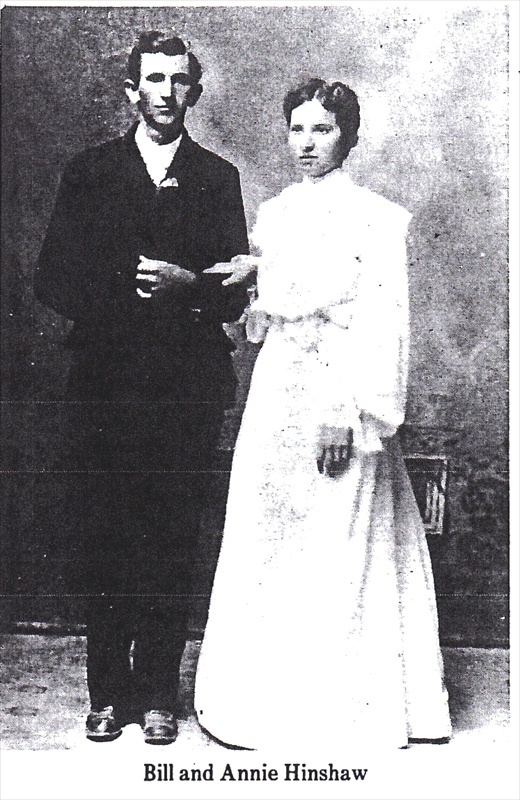 Hinshaw, Annie, wife, age 44, born in Texas; father born in Missouri; mother born in Illinois; first married at age 18. Hinshaw, Ellen, daughter, age 20, born in Texas; father born in Iowa; mother born in Texas. Hinshaw, Ozella, daughter, age 17, born in Texas; father born in Iowa; mother born in Texas; attended school. Hinshaw, Lawrence, son, age 10, born in Texas; father born in Iowa; mother born in Texas; attended school. Hinshaw, Winston, son, age 6, born in Texas; father born in Iowa; mother born in Texas. Hinshaw, Dorthy, daughter, age 2 years 1 month, born in Texas; father born in Iowa; mother born in Texas. 1910 census, Justice Precinct 1, Edwards County, Texas; roll T624-1547, ED 55, page 58A, line #46, dwelling #142, family #142. 1930 census, Precinct 4, Parker County, Texas; roll T626-2383, ED 14, page 6A, line #26, dwelling #118, family #119. Contribution from Elfreida Blocker Hinshaw. Obituary of Cora O. (Hinshaw) Barham. Obituary of Winston Frederick Hinshaw. Parker County, Texas, Births - 1930; USGenWeb Archives.